Carlos Tevez will ply his trade at Shanghai Shenhua. CHINA WILL PUT limits on the wild sums its clubs are spending on international football players, authorities said today, days after the transfer window opened and the Asian record was promptly smashed. In an interview posted on the Chinese General Administration of Sport, an unnamed spokesman said the government would “regulate and restrain high-priced signings, and make reasonable restrictions on players’ high incomes”. The statement came days after Shanghai SIPG recruited Brazilian star Oscar from Chelsea in a €60 million deal that broke the Asian transfer record. 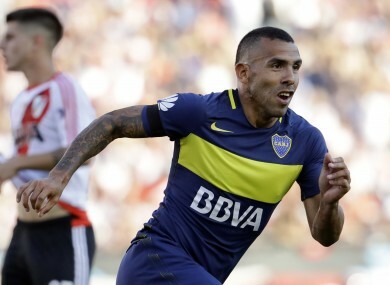 Carlos Tevez, Argentina’s former Manchester United and Manchester City striker, was lured to rival Chinese Super League club Shanghai Shenhua in another big-money deal. Tevez’s transfer fee was believed to be around €10.5 million and the 32-year-old is reportedly set to become the highest-paid player in the world with a two-year contract of €38 million per season. Oscar’s deal with Shanghai SIPG is thought to be €24 million a season — which would still put him above Real Madrid’s Cristiano Ronaldo and Lionel Messi of Barcelona. Last year Chinese teams broke the Asian transfer record four times — including three times in 10 days in the winter transfer window, when their spending outstripped even the mega-rich English Premier League. The world-beating deals are part of a Chinese rush into football that seems to be driven more by political calculations than fiscal ones. China’s national team is ranked a lowly 82nd in the world — just below the Caribbean island nation of St Kitts and Nevis, population less than 60,000 — but Chinese president Xi Jinping has declared his hopes of the country one day hosting and winning a World Cup, prompting a flood of money into its top professional teams. The wild spending has drawn criticism in China, with many fans asking whether the huge sums would be better spent on building up the country’s lagging infrastructure and talent in the sport. Without citing specific numbers or names, the sports administration official said the government would “set the upper limit” for players’ transfer fees and income and control “irrational investment”. It would consider measures such as taking fees from clubs that spend excessively to support youth development programmes. “We must take building hundred-year clubs as the goal,” the spokesman said, adding that clubs’ financial supervision would be strengthened, and their spending on players would be controlled. We will remove the seriously insolvent clubs from the professional league. In December the Chinese Football Association, the sport’s governing body in China, announced it will lower the number of overseas players allowed on domestic teams from five to four. Email “China to crack down on record-breaking spending by football clubs”. Feedback on “China to crack down on record-breaking spending by football clubs”.